The charming Normandy port town of Honfleur is a lovely place to spend an afternoon exploring and relaxing. Honfleur, 64 km (40 miles) northeast of Caen, 194 km (121 miles) northwest of Paris (map), is a lovely medieval port town on the coast of Normandy from which explorer Samuel de Champlain set sail for Canada, founding the city of Québec. The Vieux Bassin, or old harbor, is lined with restaurants and cafés. The wooden Church of Ste-Catherine is also nearby. 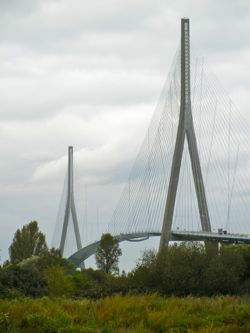 Nearby is the Pont de Normandie (1995) which connects the Honfleur region with the port city of Le Havre. Honfleur is a busy weekend and summer tourist town (similar to Rockport, MA), that attracts Parisians and others for its charm. It's known as an artists' haven, and Monet spent time here with his friend Eugène Boudin. It's quite touristy, but still very picturesque and fun. Its medieval streets, lovely port, interesting architecture, large parks, and river cruises make it a fine place to visit. 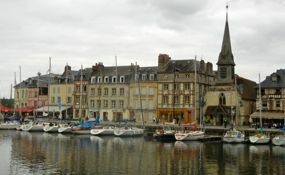 Honfleur is only 65 kilometers (40 miles) north of Camembert, where one of Normandy's most famous cheeses is produced.